The Life Sciences Centre (LSC) is the largest building on the UBC Point Grey campus. Completed in 2004, this $125 million, 52,165 square meter building was built to accommodate the Distributed Medical Educational Program—which has nearly doubled the number of yearly medical school graduates in the province since its inception. Due to the building’s size and the density of research activities hosted, the LSC consumes roughly 10% of the campus’s energy. Since 2012, UBC’s Energy Conservation and Innovation group has worked to dramatically reduce energy consumption in this building. As of 2018, we have reduced this building’s energy consumption by 37%; saving the University over $600,000 annually in energy costs and reducing GHG emissions by 2100 Tons. This is the equivalent of taking 464 cars off of the road! 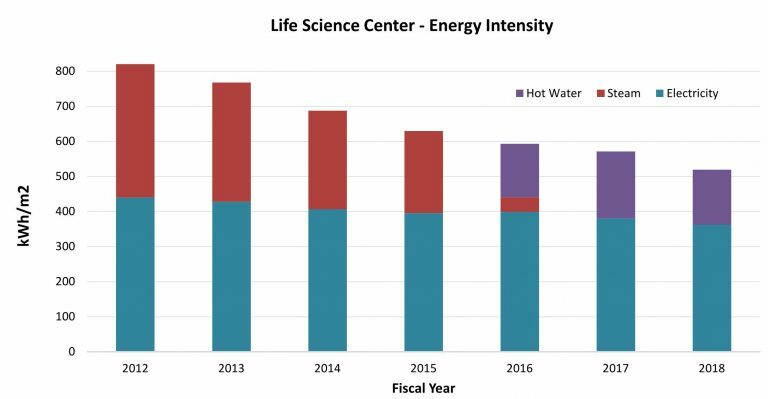 Tweaking and optimizing lowered the Energy Use at LSC by 37% over 6 years! Optimized and staged the building’s three chillers, significantly improving cooling plant efficiency. 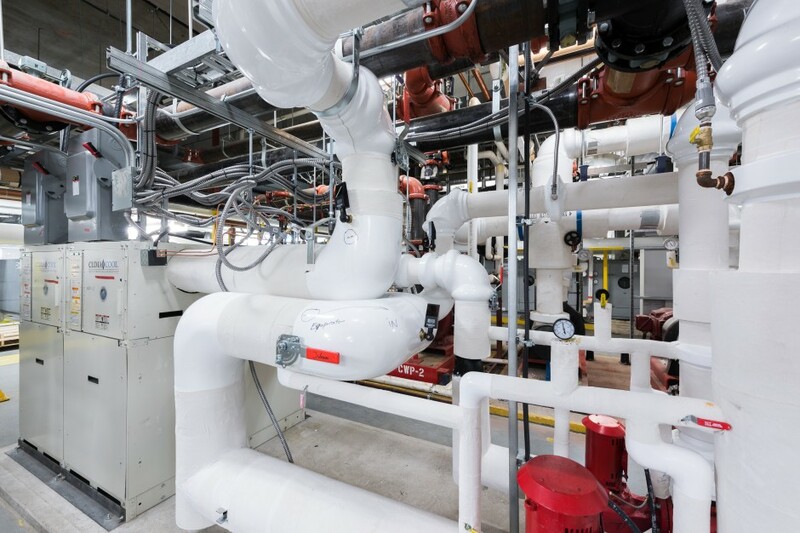 Recommissioned building control systems to eliminate simultaneous heating and cooling issues. Launched comprehensive coil cleaning and air filter replacement programs. Participated in BC Hydro’s Continuous Optimization program. These seemingly minor tweaks have reduced the LSC’s total Energy Use Intensity (EUI) by 24 per cent between 2011 and 2015. This translates into cost savings upwards of $400,000 per year. 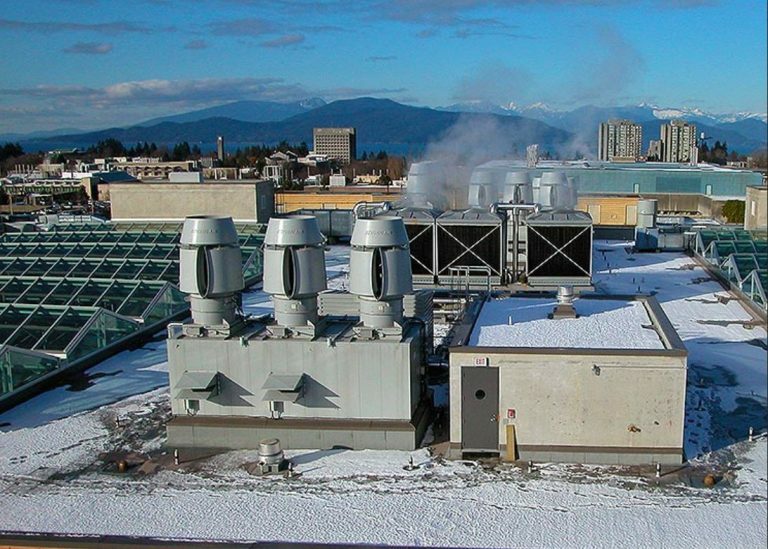 In 2015, with funding assistance from Fortis BC and the provincial government’s Carbon Neutral Action Fund, the Energy Conservation and Innovation team installed a heat recovery chiller. The heat recovery chiller provides the baseload cooling capacity for Life Sciences while recovering heat at a much higher temperature from the condenser water loop, offsetting the amount of heat required from the district energy system. On average, this chiller recovers 22,000 GJ of heat annually, and has lowered the life sciences thermal energy consumption by 20%. Starting in March of 2016, optimizations to the building’s exhaust system were undertaken. 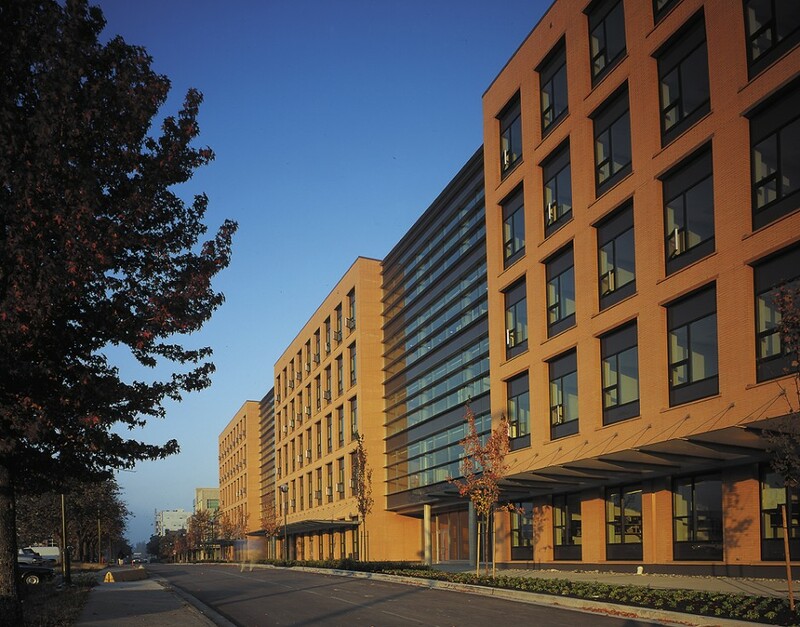 Life Science Center was one of a number of buildings across campus to take part in a multi-building variable air volume exhaust project. This initiative partnered with CPP Wind and Siemens Automation to reduce energy consumption from the exhaust fans by varying the speed the fans run at using a wind responsive system and adjusting based on actual building exhaust demand. The VAV exhaust projects saves 1400 MWh annually, and has reduced the building’s electrical demand by 10%. 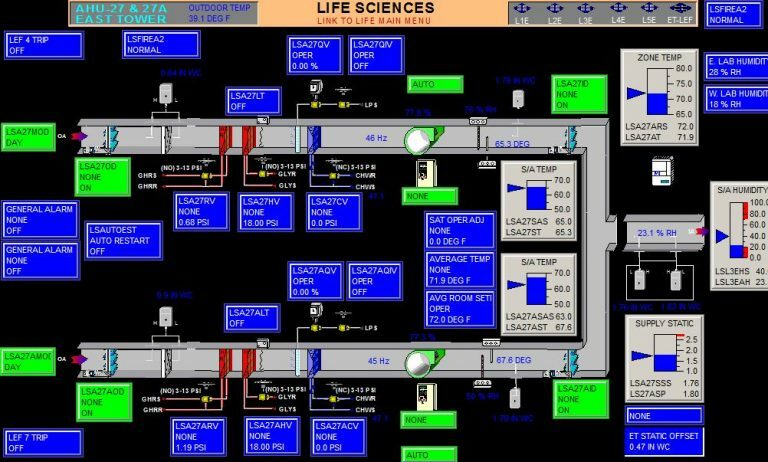 In 2017, further optimization initiatives were undertaken at Life Science Centre, these initiatives include getting the building up to current standards in terms of laboratory airflow rates and implementing a static pressure reset on the main fan systems. Airflow rates in the building were updated to UBC’s current standard of 8 ACH (air changes per hour) during the daytime and 4 ACH (air changes per hour) at night. A static pressure reset on the main air handler fans was implemented, so that the fans static pressure responds to building demand. Combine, these two measures have saved 750 MWh of electricity and 2800 GJ of natural gas annually. The control sequences for AHU 27,serving the East Tower at LSC, was one of three air handling units updated with a static pressure reset control strategy. Overall, all of these measures have reduced Life Science’s energy intensity by 37%, roughly 300 kWh/m2 per year!